The six knitting projects in this collection are based on the enchanting medieval story of Sir Gawain and the Green Knight. Five stunning, crescent-shaped shawls represent the five knightly virtues symbolized on Gawain’s shield, with an additional sixth project based upon the magical belt that replaces Gawain’s shield later in the story. Included along with the patterns is a summary of the text as well as a discussion of the role of Gawain’s shield and the Green Girdle in both the story itself as well as in the patterns. In Chaucer’s Parliament of Fowls, the birds have all gathered together in order to choose their mates for the coming year. Dame Nature presides over the gathering, which takes place in a lush garden full of spring blossoms. The flowers on this shawl symbolize Dame Nature’s power over the growth surrounding her. This cowl uses a leaf and flower motif to represent the maiden Blodeuwedd, who was created by two magicians from flowers so she wouldn’t be considered a “human” woman and thus could marry Lleu Llaw Gyffes. The pattern is both fully written out and charted, so you can use whichever type of directions works best for you. This rhomboid shawl contains a rectangular center that can be customized to your desired size with each end narrowing to a point. You can wear this as a wrap around your shoulders or as a scarf around your neck. The twisted stitches in this hat provide a subtle texture and spiral pattern. Use a semi-solid or tonal colored yarn to provide depth and dimension to the hat. The decreases at the top of the hat are worked quickly to give the top a gathered appearance. 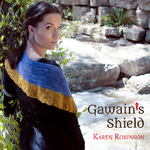 This shawl is part of the Gawain’s Shield shawl collection, based upon the medieval story of Sir Gawain and the Green Knight. Generosity covers more than just giving money, and in many ways it can be thought of as giving a helping hand. The lace border resembles fingers, providing that helping hand on this shawl. The Astolat Shawl is a triangular shawl worked from the top down, beginning with a garter tab cast on and increasing evenly to create a symmetrical shawl. The lace pattern resembles shields with a heart border along the bottom to represent the unrequited love of Elaine of Astolat for Lancelot. This scarf uses an easy-to-memorize lace pattern suitable for beginning knitters and can be customized to any desired length.